This will be an incredible experience. I met Namgyal Wangchuk for the first time at his coronation in Dharamsala, Northern India in June 2004. Namgyal Wangchuk was obviously overwhelmed by the fact that he would now officially take his fathers place, that he would now have to shoulder an inheritance that comes with a lineage that has defined the fate of Tibet not only over centuries, but basically since it was formed. Back then; Namgyal Wangchuk was 12-years-old. Although I never met his father, I had proposed the idea of a film about the unbroken lineage of the Great Religious Kings of Tibet and he loved it. The father’s struggle for his own survival, incarcerated by Chinese authorities for 20 years, and for the survival of his lineage that is unbroken for more than a thousand years, led me to the working title “The Will to Survive”. But then the father died and everything changed. A high-ranking Lama set the date for Namgyal Wangchuk’s coronation for June 2004 as he had identified it as very auspicious for this ceremony. It was almost one year after the loss of his father. In the coming years, whenever I visited India to continue filming and research, I visited Namgyal Wangchuk and his family. He was 15 years old and when I met him again in October 2007, I was happy to see the boy from 2004 growing into a young man. He and his family have also become good friends. With his devotion to the principles of Tibetan Buddhism, his kindness and modesty, he touches the heart of everyone who meets him. Now we are back here to help him tell his story. Today we packed our camera equipment and left to the Tibetan Children Village. It was a ten-minute taxi ride from our hotel. From where the taxi dropped us off it was another ten-minute hike, and perhaps I am more out of shape than I would ever admit to myself – but I will blame it on the altitude! A stray dog passes through the hallway. I hear his paws come and go as they hit the concrete floor. There is a window large enough for me to sit in and I crawl up into its ledge. I welcome the sun as it hits my face. I notice a woman on the roof of the house across from me. She is singing while doing laundry and tending to her infant. The colors are so bright. In the same compartment across from me there is a boy studying. I hear laughter. Pang. Pang. Pang. It must be a hammer in the distance. Dirk and Oliver meet me outside the door and this time they bring the person whom the door belongs to. Namgyal Wangchuk Trichen Lhagyari is a 16-year-old boy – handsome, sweet and a little shy. Dirk introduces us and he graciously reached out his hand, which of course I took in return. He has a great smile. And now I smile… this is the heart of a King. But, the room itself… No! King? Hiking down without equipment was much easier. It was very interesting to meet Namgyal. I don’t know what or if I expected anything. All I knew was a brief history of his lineage. I was taken aback by this soft-spoken boy. Dirk had previously told me that Namgyal had once said, “I am happiest when I am just hanging out with my friends.” In this expression of happiness you can understand a desire- a desire to be “average.” And perhaps all my stereotypes of what I would expect from a teenage boy are present in Namgyal, but what I saw today was an “old soul” – insightful, compassionate, and listening, he seemed to always be listening. This friction is very interesting to me. There is a desire to be average and then the King, who knows his history and the expectations of leadership. But at the age of 16, how do you grasp such expectations? How do you confront, interact, and respond to this ancient blood-line that has been passed down from generation to generation. And now another layer of complexity – He lives in exile. He has never seen the palace, in which his father and all the Kings before him lived. He has never seen Tibet. I hope that this project will give Namgyal the opportunity to explore these questions and dynamics of his life. Namgyal’s dorm at Tibetan Children’s Village (TCV). There is a large open space below the Tibetan Children’s Village (TCV) where all celebrations, ceremonies and presentations take place, but on most days it is filled with young boys playing soccer. As we walk through the amphitheater, Dirk runs around kicking the ball back and forth. I watch laughing children play near a small stream; Indian women cross through the dust with large bundles of brush on their backs. Above us there is a steep set of stairs that wrap around the mountain. A familiar voice shouts from his place and we look up to find Namgyal with a friend coming to greet us. We meet half way. The previous day Dirk went over the equipment — tripod, camera, audio. So today we set everything up. Dirk encourages Namgyal to experiment. Dirk gives a basic overview of the camera’s functions, but it is apparent that between our last meeting and today Namgyal has already learned the camera’s basic functions and more. We see our filmmaker take interest. It is very exciting to see this transformation. Dirk offers instruction where it seems needed, but for the most part Namgyal is eager to just experiment on his own. The shy, soft spoken who’s face was hard to read — today this young boy’s face is very easy to read, and it is inspiring to watch. TCV seems like a kind of holiday away from the constant honking and bustling of Dharamshala. The concept and sense of space in India is very different than in America – and by different I mean it doesn’t exist. When we are at TCV, I want to stretch, and I am both surprised and eager to be able to reach my arm out at full length without the worry of losing it to a passing car or stampede of people. to tell Dirk what is out of range. Meanwhile, we collect a whole audience of India workers. They all hover over Namgyal to get a glimpse of the viewfinder, as if the viewfinder is a world-renowned fortune teller! A few of the boys walk up the hill to find flowers returning with hopes of attracting our attention. They were silently sweet and played this kind of chase and catch game with the lens or our camera. 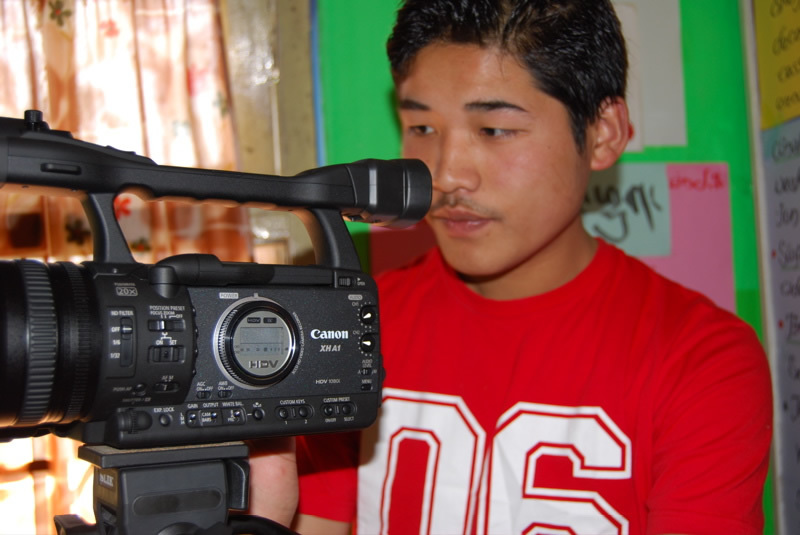 Namgyal gets more comfortable with being both behind and in front of the camera. He does an introduction of himself, speaking in both Tibetan and English. It is great to see this development. Afterward, Namgyal interviews me, and I think I am more shy then him! He seems more and more confident each day. The last part of the lesson is focused on framing. Dirk explains positioning your interviewee on the right or left side of your frame, instead of in the center. Namgyal also takes the camera off the tripod. He walks around with it to get a feel for the kind of filming – sometimes talking into it, other times capturing what is around him. Namgyal is smiling and laughing. I think our filmmaker is well on his way! I missed this lesson, but Dirk says it is really the day Namgyal came into his own – technically and creatively. Namgal, Dirk and Oliver walked to the temple, giving Namgyal the freedom to suggest what they would work on today. Namgyal took this challenge head on! At the temple they ran into three of Namgyal’s friends — a perfect opportunity for some interviews! Namgyal set everything up entirely on his own. He also set up each interview situation. They did both sitting and walking interviews, creating situations for formal and informal conversations. Dirk described how comfortable Namgual looked. Dirk provided some guidance for working with a handheld camera, using your arm as a tripod, or how to move the camera smoothly during an interview. Most of the interviews were in Tibetan, which Namgyal then translated. One friend told Namgyal he should get out more with friends and study less. This, to me, shows the friction between the responsibilities of a King and the realities of a teenager. We are making good progress and Namgyal Wangchuk seems to enjoy his new role more with every day and every meeting. 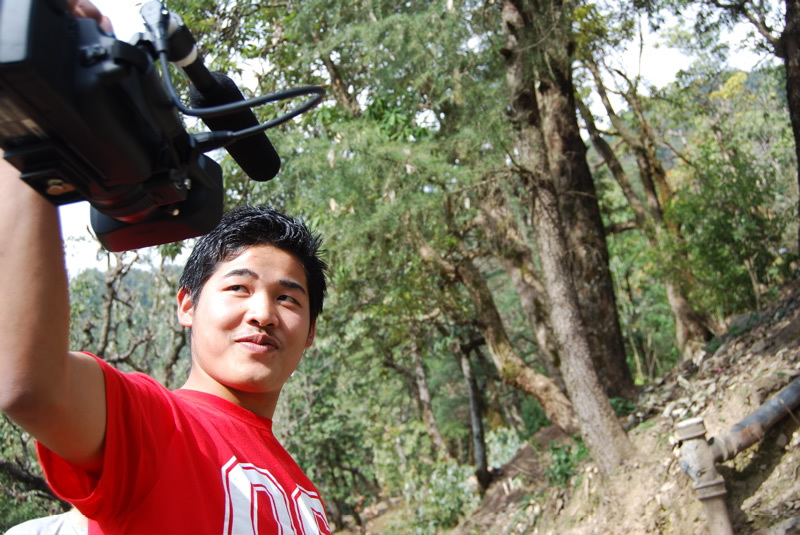 Namgyal seems really comfortable using and working the camera independently. Together they explore questions like what does a wide-shot tell you? A close-up? Dirk also explains the relationship between subject and environment. For example, talking about filming a King on top of a mountain. This image makes sense to the viewer, and there is no conflict. But, what happens if the King sits in a tiny, concrete dorm room? Maybe it creates a kind of tension to the viewer… Or how about a young man talking about becoming a monk, sitting in front of a temple versus a military base… When do we want to fulfill the audience’s expectations and when do we want to surprise them? Dirk waits for a response … a sudden smile breaks across Namgyal’s face. 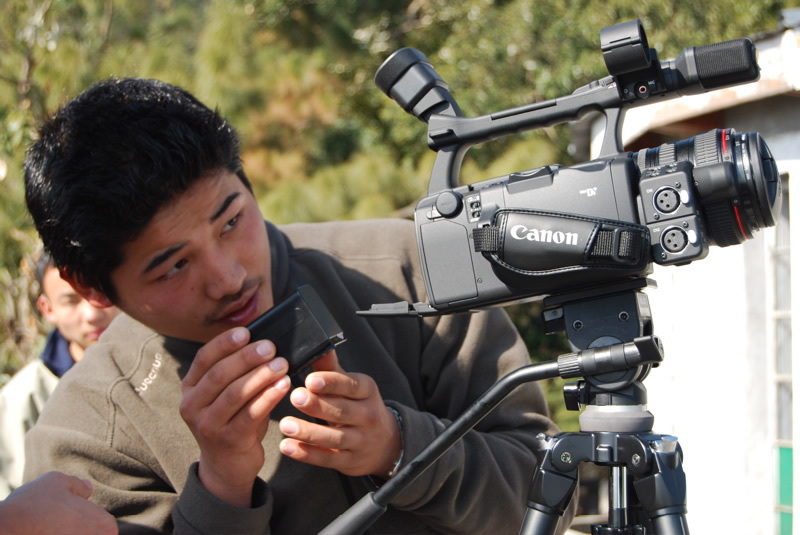 As we leave TCV, Namgyal says he has many ideas, and he can’t wait for exams to be over so he could continue filming….